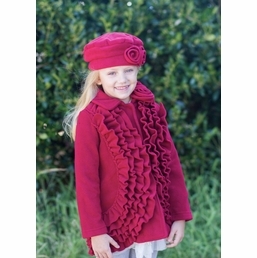 Browse our beautiful additions to our award-winning Kate Mack brand of children’s designer clothing from Adorables Children. Kate Mack’s innovative designs have made apparel from this world-famous fashion house a favorite of Hollywood moms and the pages of Women’s Wear Daily, Vogue Bambini, The Wall Street Journal and Teen Vogue. Kate Mack designer and owner Bernadette Reiss has been the recipient of numerous fashion industry awards for Kate Mack’s elegant girls’ dresses, swimwear and outerwear. This brand adds contemporary flair to many of its timeless designs for little girls and young teens. President Obama’s pretty daughter Malia wore a red taffeta dress by Kate Mack to celebrate her father’s election win. There’s no need to travel to the world’s finest children’s boutiques or luxury stores like Harrods and Neiman Marcs when you can shop our collection of the best of Kate Mack for your best-dressed little girl. Click on our detailed size charts specifically for Kate Mack children’s apparel in infant and toddler sizes and for girls’ sizes 4 to 16. Kate Mack’s dresses are perfect for keepsake family photographs. Let her wear a Kate Mack designer dress for truly memorable school photos. We have Kate Mack swimwear, rompers, dresses and two-piece casual sets in pretty floral patterns with touches of darling bows, sparkly sequins or net skirting. We have elegantly designed little girl dresses by Kate Mack for special parties and formal portraits. We have colorful casual beach wear with bohemian flourishes. See the entire Kate Mack Collection here!